Xcel transmission — Opposition anyone??? Poor Xcel, getting picked on… a City of Minneapolis resolution to delay the route application for the Hiawatha Project transmission line, and a unanimous preference for undergrounding if it should be built. SNORT! A resolution asking Xcel Energy to delay its proposed high-voltage transmission line in south Minneapolis and offering an alternate route advanced Monday at City Hall. The resolution sent to the full council is a rebuff to Xcel’s preferred route for the power line along the rim of the Midtown Greenway recreational corridor. It was approved without opposition by the council’s Health, Energy and Environment Committee and is due for a Feb. 6 council vote. The language approved Monday asks Xcel for more study of electrical needs in the central Lake Street corridor that the line would bisect and urges that alternative ways to supply those needs be investigated. But if the line is needed, it should be buried under E. 28th Street, according to the resolution by Council Members Gary Schiff, Robert Liligren and Cam Gordon. Xcel has said burying the line would add nearly $16 million to the cost. Xcel spent much of its presentation arguing that localized power-generation projects or conservation measures alone won’t come close to negating the need for an additional 100 megawatts of power to the area to assure reliable service. 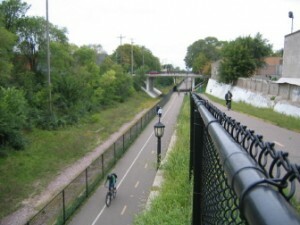 The utility proposes to build the line mostly on the south rim of the greenway, crossing its bike and walking paths four times. The $15 million project would also include a substation on the east side of Hiawatha Avenue at 28th, where an existing transmission line now runs, and another on Oakland Avenue. The Midtown Greenway Coalition, an advocacy group for the corridor, also has opposed Xcel’s preferred route and has sought more study of alternatives. Betty Mirzayi, Xcel’s project manager, said the company forecasts growth in demand for electricity of 1.5 percent annually for the area to be supplied by the proposed line. But speakers among the many residents who appeared in support of the resolution said they want more proof that the power line is the only way to improve service. They also argued that the line would stunt planned housing development along the greenway because potential residents would be leery of living near the line. One legislator, Rep. Karen Clark, DFL-Minneapolis, said later Monday she’s considering legislation that would require additional analysis by the state and Xcel of any health effects associated with the high-voltage line in areas with high poverty or high minority concentrations, which describes portions of the proposed route. Mirzayi said the permitting process, which will be under the authority of state agencies, provides an arena for analysis of the issues raised by those opposed to the line. Xcel plans to submit its proposal to the Minnesota Public Utilities Commission by the end of March and wants to begin using the new facilities in the first half of 2011. Washington, DC – Less than three days after the Bush Administration left office, the Environmental Protection Agency (EPA) has overturned the State of South Dakota’s approval of the massive Big Stone II coal-fired power plant. The EPA’s decision comes after the state failed to require state-of-the-art pollution controls for the coal plant that would address concerns about harmful soot, smog and global warming pollution. “This is a great day not only for clean energy and people’s health, it’s a victory for the rule of law,” said Bruce Nilles, Director of the Sierra Club’s Move Beyond Coal Campaign. “EPA is signaling that it is back to enforcing longstanding legal requirements fairly and consistently nationwide,” added Nilles. As the first major coal plant decision by the EPA since President Obama took office, this decision signals that the dozens of other coal plant proposals currently in permitting processes nationwide will face a new level of federal scrutiny. Sierra Club and Clean Water Action have been working to stop the Big Stone II project and ramp up clean energy investments in for more than three years. This decision likely spells the end of Otter Tail Power’s Big Stone II coal plant. While for the past eight years the Bush Administration has refused to regulate global warming pollution, even after being ordered to do so by the US Supreme Court, President Obama has pledged that the US will cut global warming pollution and do its part to avoid the worst consequences of climate change. With coal-fired power plants accounting for almost 30% of our nation’s carbon dioxide emissions, burning less coal and investing in clean energy such as wind and solar instead is a common sense approach to helping meet global warming pollution reduction goals. The proposed Big Stone II 500-megawatt coal plant would have emitted more than 4 million tons of global pollution annually. At a minimum, Otter Tail Power will have to go back to the drawing board and redesign the project to incorporate the best and maximum available control technology for pollution like soot and smog. Sierra Club and Clean Water Action will be pushing for EPA to set limits also for carbon dioxide, the main contributor to global warming. Now, can we get them to end Excelsior Energy’s Mesaba Project? A while back, in Dimock, PA, a woman’s well blew up just a little down the road from where they were doing gas drilling… funny how that works. Now it seems they’re admitting a relationship between the two, and are giving people water, those who took their water, shook it up, and LIT IT! They “just felt unsafe,” yeah, I guess… It seems it’s taking a LONG time for anything to happen here. DIMOCK TWP. — Cabot Oil and Gas installed fresh water supplies this week at four residences where methane has been found in private water wells. The company, which is extracting gas from the Marcellus Shale in the region, also hired a water well installer to inspect wells at two additional residences today where the state Department of Environmental Protection has found a “significant presence” of gas, a Cabot spokesman said. The actions come as part of an ongoing investigation into the cause of an explosion that blew apart a concrete slab above a water well in a township resident’s front yard on Jan. 1. In the weeks since the blast, DEP, Cabot and the local fire department have inspected about a dozen homes for the presence of gas and have taken samples from at least six wells that indicated gas in vapor form had gathered in the well casings. So far, no gas has been discovered in homes or basements. The Cabot spokesman, Kenneth Komoroski, said the company decided to install temporary water tanks at the four homes after hearing reports that residents were able to light gas vapors– causing a “puff of flame”– after they captured, shook, then uncapped a bottle of their well water. “The residents all had a concern about using the water and just felt unsafe, so we decided to supply them with a water supply while we investigate the situation,” he said. DEP is currently analyzing laboratory results for both water and gas samples taken by department inspectors this month, DEP spokesman Mark Carmon said this week. The analysis may reveal the geology where the gas originated. Mr. Komoroski said Cabot has hired a hydro-geologist to help evaluate how gas might be migrating into the water supply. Cabot crews are also working on a gas well site today near the four affected homes on Carter Road “to evaluate whether or not that’s a pathway,” Mr. Komoroski said. “We felt it best to take a step back and take a comprehensive look,” he said. JUST SAY NO TO TRANSMISSION FOR COAL AND NUCLEAR. Delmarva Power will be hosting three meetings in Sussex County on the MAPP transmission line, no not MAPP of “MAPP map” fame, but Mid-Atlantic Power Pathway, a big line designed to bring coal generated electricity through Delaware, and take Delaware’s Indian River coal generation north east into New Jersey. Bi-State Blvd. & Grove St.
Delaware is way behind in transmission regulation. Unlike most states, Delaware does NOTHING at all to regulate transmission — there’s no Certificate of Need or Certificate of Public Convenience and Necessity required, they do NOT have to demonstrate that the line is needed. And there’s no PSC routing proceeding either. In most states, they DO have to demonstrate need or the line cannot be built, and the line must be for a public purpose. For the MAPP line, which is bulk power transfer, MARKET TRANSACTIONS, there’s no public purpose here, just private purpose, corporate profit. There’s nothing in it for Delaware. Well, it does enable NRG to move its coal generation around more easily. Moreover, building transmission seems to make more sense for Delaware than building additional natural gas capacity. After the state agencies acted in May, the Mid-Atlantic Power Pathway received interim approvals from the federal government, the regional transmission operator and Gov. Minner. If and when it is finally approved, MAPP would run a high-voltage line connecting from multiple power plants and power users in Virginia, into Delaware all the way to Indian River. This would provide any backup power needed. And if Delaware builds more offshore wind farms, that also would make it easier for us to sell excess wind power to other states. NO NO NO, that only enables coal and nuclear. Whatever are you thinking? Delaware Electric Cooperative has said that it wants to build a NEW North Anna nuclear plant — is that still DEC’s plan? If so, the MAPP line would get that nuclear power there, and all DEC customers would be participating in nuclear expansion. Is that what you want? This is an issue for Sussex county to weigh in on now! Shutting down NRG’s Indian River Generating Plant is the logical step to help wind development in Delaware, both in market development and transmission access. And of course it’s the logical step to reduce toxic emissions in Delaware — the Indian River Generating Plant is the largest point-source polluter in Delaware. 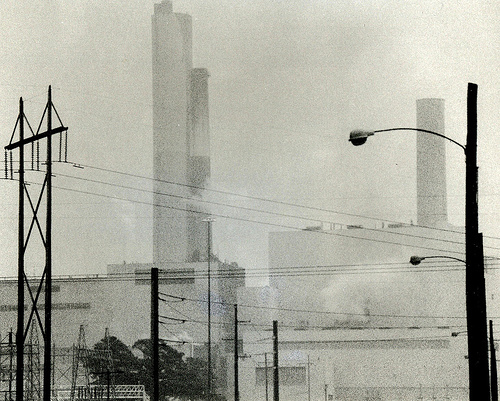 To quote Muller: DELAWARE NEEDS TO STOP BURNING COAL. How would shutting down the Indian River plant enable wind? 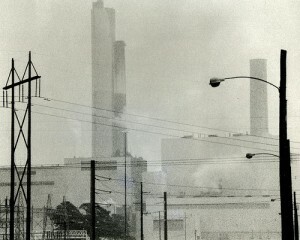 Indian River’s two smallest plants will be shut down in 2009, and removal of that generation leaves enough transmission infrastructure generation and reservations for the Bluewater Wind project. If Indian River was completely shut down, there’s room for a lot more off-shore-wind generated electricity than Bluewater plans — several times the MW of the Bluewater Project. Let’s get to it — shut down Indian River now — and if NRG’s bid for gas generation to back up wind is approved, that would be sited there — just the right place back up wind and provide reactive power for the system. And a little sidebar — though many Renewable Energy Standards passed, ALL have a fatal flaw — not a single one is linked to any shut down of fossil fuel generation. So for a 25% RES, we’re looking at adding that above current generation, not cutting generation, so the numbers look like this: 100% demand + 25% RES = 125% rather than 100% demand -25% fossil fuel + 25% RES = 100%. That may seem simple… so why are all RES’s missing this important connection? 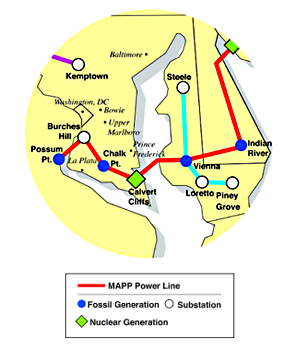 What this MAPP line does is enable coal generation from the other end of the line and coal generation at Indian River to continue, and to be sold on the market, so that even if Delaware does not use the generation, they can sell it elsewhere. Even if CO2 externalities add to the cost, on the spot market they can sell it anywhere and still make a lot of money. Yeah, good idea. 1) SHUT DOWN ALL OF NRG’S INDIAN RIVER COAL GENERATING PLANT AND MAKE ROOM FOR WIND! 2) JUST SAY NO TO TRANSMISSION FOR COAL! Mid-Atlantic Power Pathway Meetings Scheduled for Sussex County, Del. Delmarva Power, a subsidiary of Pepco Holdings, Inc., will hold community informational meetings in Sussex County, Del., on Tuesday, Jan. 27; Thursday, Jan. 29; and Wednesday, Feb. 4, to provide information and respond to questions about the utility’s proposed 230-mile interstate electric transmission line. More than 100 miles of the Mid-Atlantic Power Pathway (MAPP) project will be built in Delaware, with much of the route constructed along existing rights-of-way. 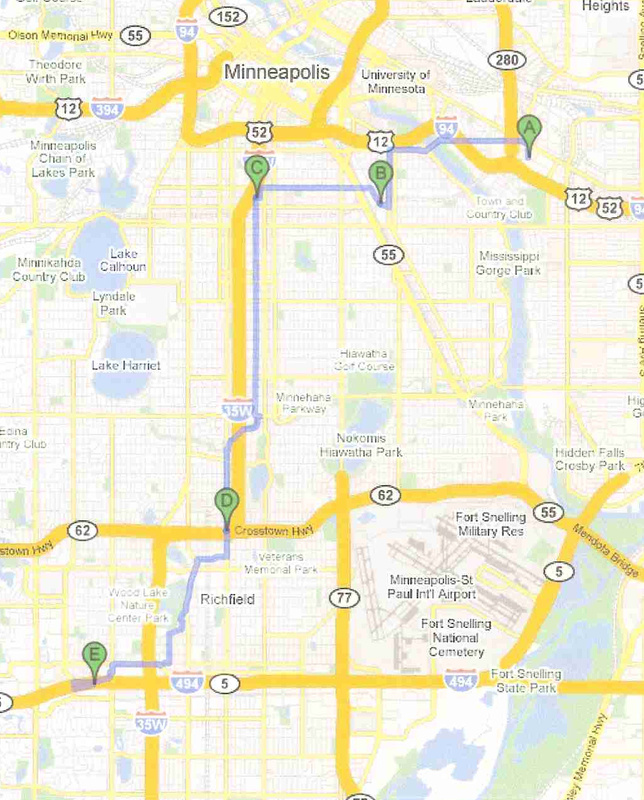 The segment from the Maryland border to Indian River is expected to be completed by June 2013. PJM Interconnection, the operator of the Mid-Atlantic power grid, is still evaluating the in-service date for the portion from Indian River to New Jersey. Each phase of the project will be placed in service as it is completed, providing immediate electricity reliability benefits to the region. Maione will brief residents on the MAPP process and provide detailed information on how the project will benefit Sussex County. Residents will have an ample opportunity to review project maps, voice concerns and question Maione and other Delmarva Power experts. Pepco Holdings, Inc. (NYSE:POM) is one of the largest energy delivery companies in the Mid-Atlantic region, serving about 1.9 million customers in Delaware, the District of Columbia, Maryland and New Jersey . PHI subsidiaries Pepco, Delmarva Power and Atlantic City Electric provide regulated electricity service; Delmarva Power also provides natural gas service. PHI provides competitive wholesale generation services through Conectiv Energy and retail energy products and services through Pepco Energy Services. President Obama… what more is there to say? And someone explain how on earth she got through the day in those shoes!